We had a total of 90 players in the $400 Limit Hold 'em event. The final five players have come to an agreement on a chip chop. Mark Ambrose is officially the winner and takes home the trophy and leather jacket! The players in the $600 NLHE Deep Stack event are now on a one-hour dinner break. There are approximately 87 players remaining. The board ran out [3c][2d][2h][5c][5s] and Williams was eliminated in 6th place for $5,197. Patrick Kelly got all in for just under 300,000 with [Td][Ts] against the [As][Qd] of Wilfredo Esguerra. Kelly had the lead before the flop but was sent home in 7th place when the board ran out [Qh][9c][4h][4d][8s]. The $400 Limit Hold 'em event is now underway. Players are starting with 5,000 in chips and the levels are 40 minutes in length. Beata Wielgoszewski moved all in for just over 200,000 before the flop with [8h][8s] and was called by Patrick Kelly holding [Ad][9h]. The board ran out [Ks][Tc][5h][Jd][9s] and Kelly caught a nine on the river to pair up and eliminate Wielgoszewski in 8th place for $3,504. A short stacked Stephen Buckley got his last few chips in the middle before the flop with [8s][7d] and was called by Lu Tsung Min holding [Ad][4s]. The board ran out [Kh][Th][9h][4d][4h] and Min took the pot to eliminate Buckley in 9th place for $2,872. We had a total of 171 players in the $600 NLHE Deep Stack event. We are down to the final nine players in the $400 NLHE Deep Stack event. Justin Pechie was yesterdays Cabot Cheese Extra Sharp Player of the Day. 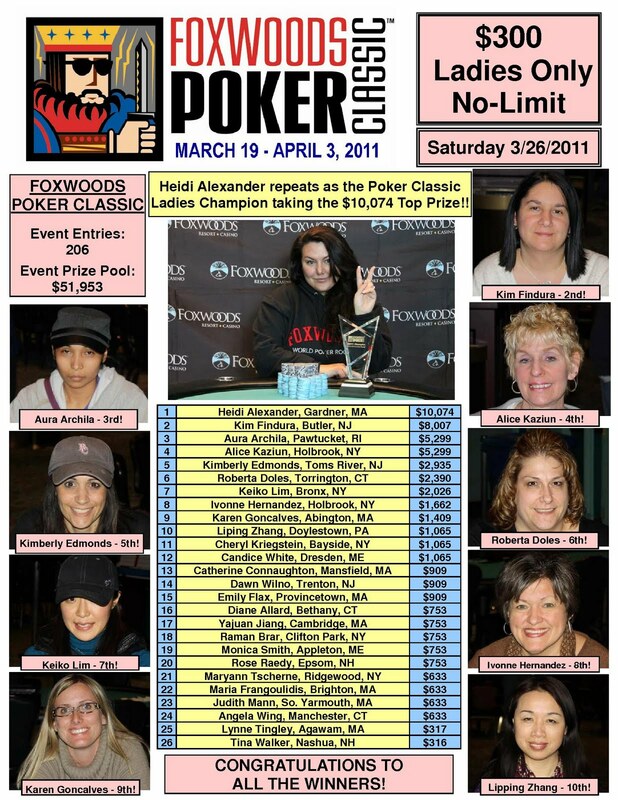 Justin bested a field of 128 players to win the $1,500 NLHE Deep Stack event at the 2011 Foxwoods Poker Classic. Justin took home the trophy, leather jacket and $48,275 for his victory. Be sure to visit Cabot at www.CabotCheese.com. $400 Deep Stack Day 2 Now Streaming Live! Day 2 of the $400 NLHE Deep Stack event is now underway. There are 19 players remaining and the blinds are now 10,000-20,000 with a 2,000 ante. $600 NLHE Deep Stack Event Underway! Players start with 20,000 in chips and levels are 50 minutes in length. Justin @looshle Pechie Wins the $1,500 NLHE! 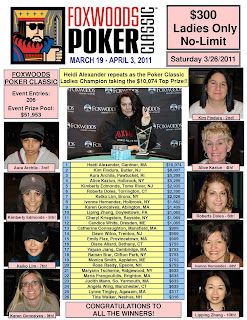 Justin Pechie is the champion of the $1,500 NLHE Deep Stack event at the 2011 Foxwoods Poker Classic. He takes home the trophy and $48,275. Congratulations Justin! After a series of pre flop raises, Brad Noonan and Justin Pechie got all the chips in the middle. Noonan held [Ac][Qc] but Pechie turned up [Qd][Qh]. The board ran out [Kh][5h][3d][5s][Qs] and Pechie's queens held up. Brad Noonan was eliminated in 2nd place and takes home $27,102.